A biome is an ecosystem containing plant and animal species that are characteristic to a specific geographic region. (An ecosystem is the community of plants and animals in an area considered together with their environment.) The nature of a biome is determined primarily by climate, including a region's annual average temperature and amount of rainfall. Biomes are often named for the vegetation found within them. They can be classified as terrestrial (land), aquatic (water), or anthropogenic (dominated by humans). Some familiar examples of biomes include tundra, desert, chaparral, and open ocean. The accompanying drawing shows the variety of biomes that can be found along just two lines of longitude on Earth's surface. A number of attempts have been made to classify the world's biomes. One of the best known was proposed by the Russian-born German climatologist Wladimir Koeppen (1846–1940). 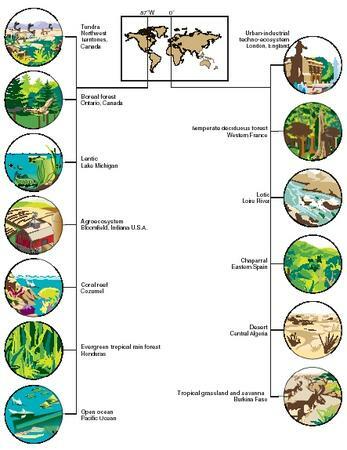 Some of the biomes described by Koeppen are described below. Tundra. A tundra is a treeless region in a cold climate with a short growing season. Most tundras receive little precipitation. Still, their soil may be moist or wet because little evaporation occurs. Loss of water by seepage is also prevented because the soil is frozen. Very little vegetation grows and very few animals live in the coldest, most northern, high-arctic tundras. These tundras are dominated by long-lived but short-statured plants, typically less than 5 to 10 centimeters (2 to 4 inches) tall. Low-arctic tundras are dominated by shrubs as tall as 1 meter (3 feet), while on wet sites relatively productive meadows of sedge, cottongrass, and grass grow. In North America, arctic tundras can support small numbers of plant-eating mammals, such as caribou and musk oxen, and even smaller numbers of their predators, such as wolves. Anthropogenic: Resulting from the influence of human action on nature. Benthic: Referring to the deepest parts of the oceans. Boreal: Located in a northern region. Conifer: Plants whose seeds are stored in cones and that retain their leaves all year around. Deciduous: Plants that lose their leaves at some season of the year, and then grow them back at another season. Ecosystem: An ecological community, including plants, animals, and microorganisms, considered together with their environment. Eutrophic: A productive aquatic region with a large nutrient supply. Herbaceous: A type of plant that has little or no woody tissue and usually lives for only one growing season. Lentic ecosystem: An ecosystem that contains standing water. Lotic ecosystem: An ecosystem that consists of running water. Monoculture: An ecosystem dominated by a single species. Oligotrophic: An unproductive aquatic region with a relatively modest nutrient supply. Pelagic: Referring to the open oceans. Polyculture: An ecosystem that consists of a wide variety of species. Tropical: Characteristic of a region or climate that is frost free with temperatures high enough to support—with adequate precipitation—plant growth year round. Upwelling: The process by which lower, nutrient-rich waters rise upward to the ocean's surface. Boreal coniferous forest. The boreal coniferous forest, or taiga, is an extensive northern biome occurring in moist climates with cold winters. The boreal forest is dominated by coniferous (cone-bearing) trees, especially species of fir, larch, pine, and spruce. Some broad-leaved trees are also present in the boreal forest, especially species of aspen, birch, poplar, and willow. Most boreal forests are subject to periodic catastrophic disturbances, such as wildfires and attacks by insects. Temperate deciduous forest. Temperate deciduous forests are dominated by a large variety of broad-leaved trees in relatively moist, temperate (mild or moderate) climates. Because these forests occur in places where the winters can be cold, the foliage of most species is seasonally deciduous, meaning that trees shed their leaves each autumn and then regrow them in the springtime. Common trees of the temperate deciduous forest biome in North America are ash, basswood, birch, cherry, chestnut, dogwood, elm, hickory, magnolia, maple, oak, tulip-tree, and walnut. Temperate rain forest. Temperate rain forests are characterized by mild winters and an abundance of rain. These systems are too moist to support wildfires. As a result, they often develop into old-growth forests, dominated by coniferous trees of mixed age and various species. Individual trees can be very large and, in extreme cases, can be more than 1,000 years old. Common trees of this biome are species of Douglas-fir, hemlock, cedar, redwood, spruce, and yellow cypress. In North America, temperate rain forests are most commonly found on the humid west coast. Temperate grassland. Temperate grasslands occur under climatic conditions that are between those that produce forests and those that produce deserts. In temperate zones, grasslands typically occur in regions where rainfall is 25 to 60 centimeters (10 to 24 inches) per year. Grasslands in North America are called prairies and in Eurasia they are often called steppes. This biome occupies vast regions of the interior of these continents. The prairie is often divided into three types according to height of the dominant vegetation: tall grass, mixed grass, and short grass. The once-extensive tall grass prairie is dominated by various species of grasses and broad-leaved, herbaceous plants such as sunflowers and blazing stars, some as tall as 3 to 4 meters (10 to 13 feet). Fire played a key role in preventing much of the tall grass prairie from developing into open forest. 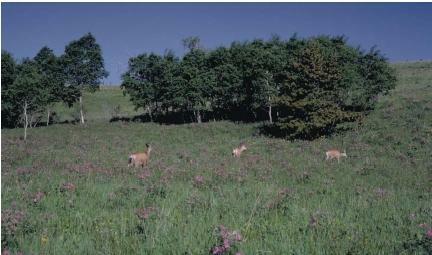 The tall grass prairie is now an endangered natural ecosystem because it has been almost entirely converted for agricultural use. The mixed grass prairie occurs where rainfall is less plentiful, and it supports shorter species of grasses and other herbaceous plants. The short grass prairie develops when there is even less precipitation, and it is subject to unpredictable years of severe drought. Tropical grassland and savanna. Tropical grasslands are present in regions with as much as 120 centimeters (47 inches) of rainfall per year, but under highly seasonal conditions with a pronounced dry season. Savannas are dominated by grasses and other herbaceous plants. However, they also have scattered shrubs and tree-sized woody plants that form a very open canopy (a layer of spreading branches). Tropical grasslands and savannas can support a great seasonal abundance of large, migratory animals as well as substantial populations of resident animals. This is especially true of Africa, where on the savanna range—among other animals—gazelles and other antelopes, rhinos, elephants, hippopotamuses, and buffalo, and various predators of these, such as lions, cheetahs, wild dogs, and hyenas. Chaparral. Chaparral is a temperate biome that develops in environments where precipitation varies widely from season to season. A common chaparral pattern involves winter rains and summer drought, the socalled Mediterranean climate. Chaparral is characterized by dwarf forests, shrubs, and herbaceous vegetation. This biome is highly prone to wildfire. In North America, chaparral is best developed in parts of the southwest, especially coastal southern California. mountains (a dry region on the side of a mountain sheltered from rain). The most prominent characteristic of a desert is the limited amount of water available. In most cases, less than 25 centimeters (10 inches) of rain fall each year. Not surprisingly, the plant life found in a desert ecosystem is strongly influenced by the availability of water: the driest deserts support almost no plant life, while less-dry deserts may support communities of herbaceous, succulent (having fleshy tissues that conserve water), and annual (returning year after year) plants. In somewhat moister places, a shrub-dominated ecosystem is able to develop. Semi-evergreen tropical forest. A semi-evergreen tropical forest is a type of tropical forest that develops when a region experiences both wet and dry seasons during the year. Because of this pattern, most trees and shrubs of this biome are seasonally deciduous, meaning that they shed their foliage in anticipation of the drier season. This biome supports a great richness of species of plants and animals, though somewhat less than in tropical rain forests. Evergreen tropical rain forest. Evergreen tropical rain forests occur in tropical climates with abundant precipitation and no seasonal drought. Because wildfires and other types of catastrophic disturbances are uncommon in this sort of climate regime, tropical rain forests usually develop into old-growth forests. As such, they contain a great richness of species of trees and other plants, a great size range of trees, and an extraordinary diversity of animals and microorganisms. Many ecologists consider the old-growth tropical rain forests the ideal ecosystem on land because of the enormous variety of species that are supported under relatively favorable climatic conditions. Freshwater biomes can be divided into three general categories: lentic, lotic, and wetlands. Lentic. A lentic ecosystem is one such as a lake or pond that contains standing water. In lentic systems, water generally flows into and out of the lake or pond on a regular basis. The rates at which inflow and outflow occur vary greatly and can range from days, in the case of small pools, to centuries, in the case of the largest lakes. The types of organisms that inhabit lentic biomes are strongly influenced by water properties, especially nutrient concentration and water transparency and depth. Waters with a large nutrient supply are highly productive, or eutrophic, while infertile waters are unproductive, or oligotrophic. Commonly, shallow bodies of water are much more productive than deeper bodies of water of the same surface area, primarily because plant growth is influenced by the ability of light to penetrate into the water. Water that becomes cloudy because of the accumulation of silt or dissolved organic matter is likely to have low productivity. Lotic. A lotic biome is one that consists of running water, as in streams or rivers. The organisms found in a lotic biome depend on factors such as the amount of water in the system, the rate at which it flows, and seasonal changes in the flow rate. Consider a stream in which flooding is common in the spring. Rapidly moving water churns up clay, silt, sand, and other materials from the streambed. The water then becomes cloudy and murky, and light is thus prevented from penetrating it. In this case the stream will not be able to support many kinds of life-forms. In general, the common lotic ecosystems such as rivers, streams, and brooks are not usually self-supporting in terms of the organisms that live within them. Instead, they typically rely on organic matter carried into them from the land around them or from upstream lakes to support fish and other organisms that live in the biome. Wetlands. Wetlands are areas that are wet or covered with water for at least part of the year. Some examples of wetlands are marshes, swamps, bogs, sloughs, and fens. Marshes are the most productive wetlands, and are typically dominated by relatively tall plants such as reeds, cat-tails, and bulrushes and by floating-leaved plants such as water lilies and lotus. Swamps are forested wetlands that are seasonally or permanently flooded. In North America, swamps are dominated by tree-sized plants such as bald cypress or silver maple. Bogs are wetlands that develop in relatively cool but wet climates. They tend to be acidic and, therefore, biologically unproductive. Bogs depend on nutrients obtained from the atmosphere, and are typically dominated by species of sphagnum moss. Fens also develop in cool and wet climates, but they have a better nutrient supply than bogs. Consequently, they are less acidic and more productive than bogs. Open ocean. The character of the open-water, or pelagic, oceanic biome is determined by factors such as waves, tides, currents, salinity (salt content), temperature, amount of light, and nutrient concentration. The number of organisms supported by these factors is small and can be compared to some of the least productive terrestrial biomes, such as deserts. The lowest level of food webs in the ocean are occupied by tiny organisms known as phytoplankton. Various species of phytoplankton range in size from extremely small bacteria to larger algae that consist of a single cell and may or may not live in large colonies. The phytoplankton are grazed upon by small crustaceans known as zooplankton. Zooplankton, in turn, are eaten by small fish. At the top of the pelagic food web are very large predators such as bluefin tuna, sharks, squid, and whales. The deepest levels of the ocean make up the benthic biome. Organisms in this biome are supported by a meager rain of dead organisms from its surface waters. The benthic ecosystems are not well known, but they appear to be extremely stable, rich in species, and low in nutrient productivity. Continental shelf waters. Continental shelf waters are areas of ocean water that lie relatively near a coastline. Compared with the open ocean, waters over continental shelves are relatively warm and are well supplied with nutrients from rivers flowing into them. A secondary source of nutrients is water brought to the surface from deeper, more fertile waters that were stirred up by turbulence caused by storms. Because of the nutrients found in the continental shelf waters, phytoplankton here are relatively abundant and support the larger animals present in the open ocean. Some of the world's most important commercial fisheries are on the continental shelves, including the North and Barents Seas of western Europe, the Grand Banks and other shallow waters of northeastern North America, the Gulf of Mexico, and inshore waters of much of western North America. Upwelling regions. In certain regions of the ocean, conditions make possible upwellings to the surface of relatively deep, nutrient rich waters. Because of the increased nutrient supply, upwelling areas are relatively fertile, and they support sizeable populations of animals, including large species of fishes and sharks, marine mammals, and seabirds. Some of Earth's most productive fisheries occur in upwelling areas, such as those off the west coast of Peru and other parts of South America and large regions of the Antarctic Ocean. Estuaries. An estuary is a region along a coastline where a river empties into the ocean. Estuaries display characteristics of both marine and freshwater biomes. They typically have substantial inflows of freshwater from the nearby land, along with large fluctuations of saltwater resulting from tidal cycles. 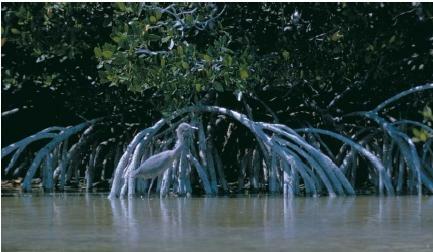 Examples of estuaries include coastal bays, sounds, river mouths, salt marshes, and tropical mangrove forests. Because the nutrients carried into them by rivers, estuaries are highly productive ecosystems. They provide important habitats for juvenile stages of many species of fish, shellfish, and crustaceans that are later harvested for food. Indeed, estuaries are sometimes called "nursery" habitats. Seashores. The seashore biome is formed where the land meets the ocean. The specific character of any given seashore biome is determined by factors such as the intensity of wave action, the frequency of major disturbances, and bottom type. In temperate waters, biomes are often characterized by large species of algae, broadly known as seaweed or kelp. In some cases, so-called kelp "forests" can develop, abundant with marine life. In ecosystems characterized by softer bottoms of sand or mud, invertebrates such as mollusks, echinoderms, crustaceans, and marine worms dominate. highly productive, even though they occur in nutrient-poor waters, and support a great variety of species, including living corals, algae, invertebrates, and fishes. Urban-industrial techno-ecosystems. The urban-industrial techno-ecosystem consists of a large metropolitan district that is dominated by humans, human dwellings, businesses, factories, other types of buildings, and roads. This biome supports many species in addition to humans. With few exceptions, however, these species are nonnative plants and animals that have been introduced from other places. These organisms typically cannot live independently outside of this biome, unless they are returned to their native biome. Rural techno-ecosystems. This anthropogenic biome occurs out-side of intensively built-up areas. This biome is made up of transportation corridors (such as highways, railways, electric power line transmission corridors, and aqueducts), small towns, and industries involved in the extraction, processing, and manufacturing of products from natural resources (such as mining). Typically, this biome supports mixtures of introduced species and those native species that are tolerant of the disturbances and other stress associated with human activities. Agroecosystems. Agroecosystems are biomes consisting of regions that are managed and harvested for human use. Farms and ranches are examples of agroecosystems. Many agroecosystems are monocultural, consisting of single types of crops, such as corn or wheat, and are not favorable to native wildlife. The objective in such systems is to manage the species in such a way as to produce a maximum dollar profit. Competing species (weeds and insect pests) are destroyed or prevented from growing or surviving. Less-intensively managed agroecosystems may contain mixtures of species, a form of land management known as polyculture. Polyculture systems may provide habitat for some native wildlife species. This is an apsolute amazing website i love it. P.S. My grade in science is 110%. I THANK THIS SITE A LOT FOR THE INFO!!! It really helped me in my biomes project in Social Studies. I love this website!!!! WHAT IS THE AMOUNT OF PRECIPITATION OF MARINE BIOME? very good inforamtion & very helpfull!! Very helpful i love it ! im going to ACEE my project ! Amazing website...very detailed and to the point! :D love it! This website really helped me on my biome project thank you for all the people that helped make this website. nice!thank you for the information it helps a lot! This website is pretty amazing!!! it helps me alot on my biology project.